Welcome to this week's volume of so we heard you liek emotes. This is the 33rd volume in a weekly series aimed towards promoting emote and emoticonists from the dA community. It features emotes posted within the past week from both well known and new emoticonists, as well as featuring some other great emote projects and contests. I really can't get my head around how smooth :inloveglomp: by MenInASuitcase is. The flawless animation and adorable glomp combine to make an outstanding and very cute emoticon. Its always great to see new emoticonists to the site already producing great emotes, and this is certainly the case with ROBlNHOOD and Chargin ma lazur beam. The laser effect is stunning to watch and the pixelling of the laser and emote are also top notch. I can't wait to see what they might create next. Favorite movies Too many to choose from! ;P Favorite games Bored Games Tools of the Trade Apo, UF, ChaosPro, CS-2, and my imagination Other Interests Fractal art, photography, nature, going hiking, painting, and pretty much anything that&#039;s fun! Sun, sand, and most especially...surfing! Well, at least for the next three weeks! I've rec'd my final grades for this semester's classes and I'm very proud to say that I passed each class with flying colors! Participating in the Round Robin IV challenge has been a blast and I really enjoyed creating the marble fractal design; which I've never done before. And after viewing the final results of the other participants, it's inspired me to continue to to improve my rendering skills for that particular design. And I really look forward to the next round. Also DWALKER1047 is hosting a fractal "Tweak-A-Thon". For more information, pay a visit to her user page and check out her journal; which says what it's all about. And finally, the new Weekly Art Feature is up and it features the fantastic works of art by a wonderful friend of mine and a very talented artist; Xantipa2 and it's my way of saying thank you to her for her friendship and support. Go have a look! You won't be disappointed! For those that have commented, faved, or otherwise added me to their DevWatch; a most sincere thank you. It is truly appreciated as are you for doing so. 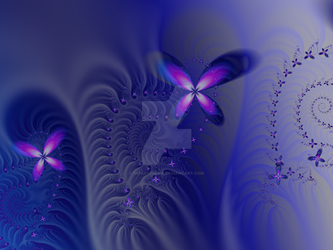 This week's Art Feature showcases the fascinating and incredible artwork of a very wonderful fractal artist, Xantipa2. She uses the many fractal rendering programs of Apophysis, Fractal Explorer, Ultra Fractal, Incendia/Xenodream, and Sterlingware. Eva also does fractal and photo manipulation as well. I have always been fascinated with the almost unique designs of Eva's artwork. Take a look below and see what I mean! And to see more of her incredible art, please pay a visit to her wonderful gallery! Please remember that all works of art showcased here in this journal are copyrighted to the artist that created them and no one else. If you want to see more incredible art from these talented artists, pay a visit to their respective galleries! That's right! Legal stuff! So please read and take heed. All images are Copyright © 2007-2009 to Alterren/Morgan Chase. All rights reserved. All art work contained in my DeviantArt gallery may not be reproduced, copied, edited, published, transmitted, borrowed, duplicated, printed, downloaded, or uploaded in any way without my express written permission. My images do not belong to the public domain. Unauthorized use of my artwork is strictly prohibited. I've decided to add this section to my journal, because I feel it necessary to do so. And these are subject to change at anytime. 1. What program(s) do you use to create your artwork?-I use a fractal rendering program called "Apophysis". The latest version is Beta v.2.08. 3. Can I use your art as a desktop background for my computer?-Not really. While I'm honored and flattered, I'd rather you ask me about that first or explain why. Send me a note, but no guarantee on a positive answer. 4. Can I display/use your artwork on/for my own website?-Absolutely not. My artwork is strictly displayed on DA; no other website has my permission to feature my artwork! Period. 5. Can I use your art/designs as a basis for creating my own?-No. It's better if you create your own designs through your own learning experience. 6. Can I use your artworks/designs in photo manipulations or other types of manipulation?-No. I'd really prefer if you didn't. You can ask me or explain why you want to do so, but I can't guarantee you a positive answer. 7. Do you do commissions/prints/tutorials/kiriban?-Nope. Not at this time. Eid Mubarak / Happy Eid! Hi Morgan . I havent been very active on dA for a while but I just wanted to drop by and say 'Hello'. I hope all is well with you and yours. Regards, Catherine. i hope all is going well. i just wanted to see how you have been.